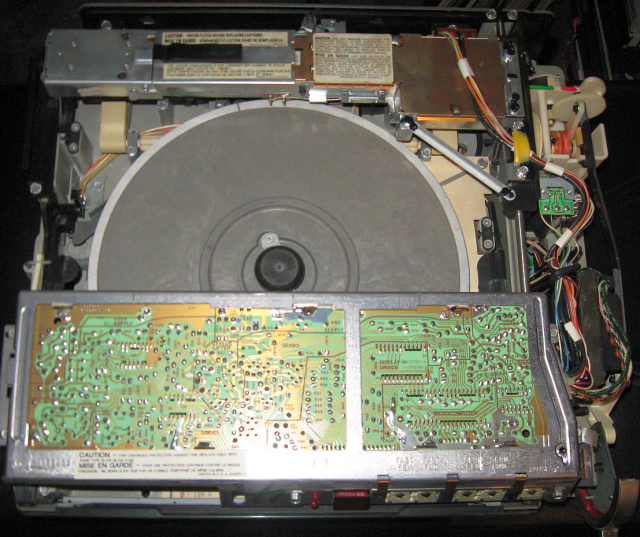 Sadly, the player either has a worn out belt that drives the servo arm along the disc for playback, think a record player's tonearm except motorized, or the arm motor itself has gotten goofy. The belt seems to have extreme difficultly with initially gripping the motor's spinning road but when it finally does the arm mechanism speeds along as if the fast forward button is engaged during what should be standard "Play" mode. I tried to "punch" and jiggle at the FF button to disengage it if that's the issue but there's no change. 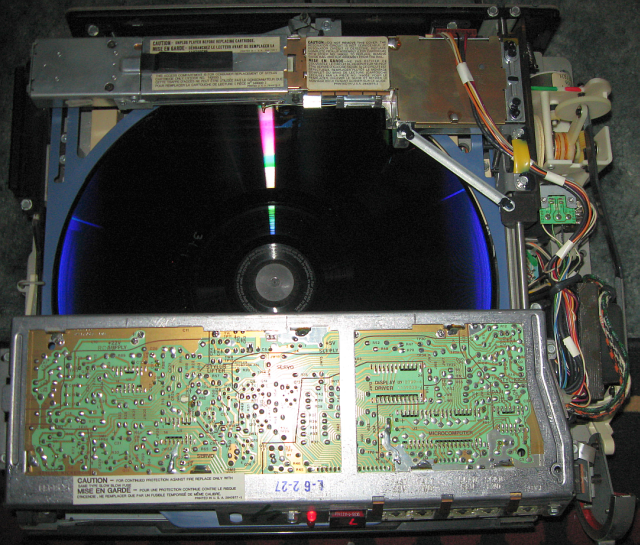 The rotating platter seems to have no problem spinning up to speed and otherwise the player appears to function properly. Where I am going with this? Nowhere in in particular. I'm a talkative dork that just loves to overly explain things far past the point of anyone else caring. Plus this might help with this problem eventually and be useful reference in the future. 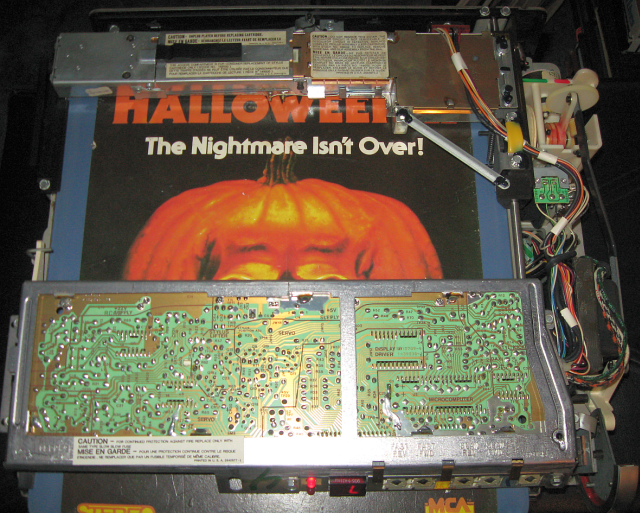 I'm keeping the player for eventual repair or at least parts. The outward comestic condition matches my working deck. 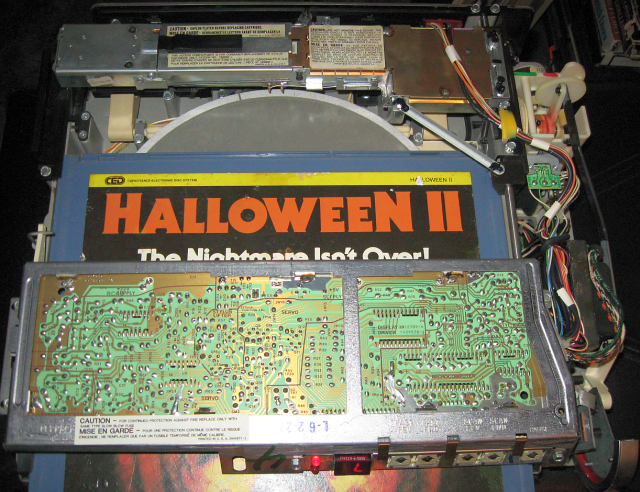 Below are pictures of the odd CED loading system with Halloween II bought with the player. The vertical bar running across the top back of the machine is the servo arm with the white plastic gears and bits on right side (incorrectly) controlling it. The slender black "pull button" with the writing sticker around it on the arm is the stylus holder. You pull that black tab to the right and a latch door opens giving you access to a cream-colored plastic box of the thing containing the needle you can pull out and replace (or plastic bag for safe keeping). Be sure to check to see if it's in there before buying one. Most players have top access door on the cabinet, like this SFT100, that have be popped open without tools to check it. Fascinating post, CED is probably the only home video format I have never had any experience of. Those discs look great. Cool post. 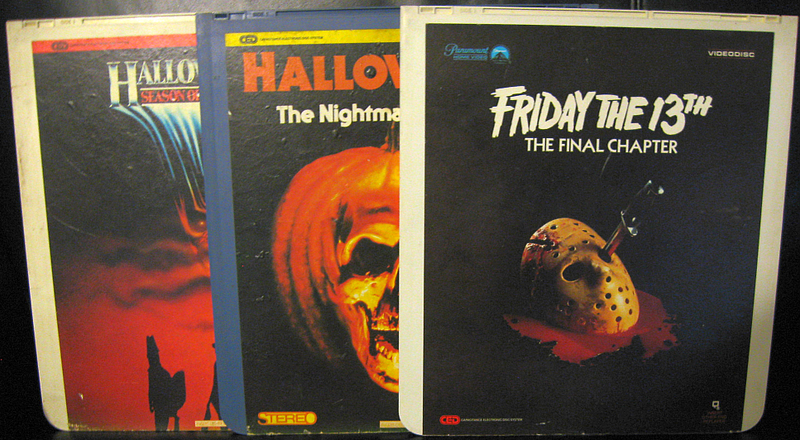 Don't worry about being overly talkative or whatever, I'm sure everyone loves reading these. i've never heard of these things, but this is really cool! i enjoy seeing the guts of the machines you find. You do know about cedatum.com right? John is awesome and can talk you through fixing any CED issue...or you can ship your broken units to him and he will refurbish them for you for cheap! There was another CED repair guy for many years whose name I won't mention...but he's retired now. I was his last customer and he ripped me off. If you are into CEDs you have to know about cedmagic I assume. I love rambling nerds who overexplain everything! I wish someone like you lived near me. It would be nice to have a friend who was interested in the same stuff as me. Even my own friends think I'm totally crazy and weird. Of course they are only interested in boring things like sitting around trying to be clever in front of each other all the time (...yawn & vomit...)...I've been out of high school since 1998. You know about cedatum.com right? John can fix your players or give advice on helping you to fix them. I love nerds who overexplain things and have strange interests!